How Does a Hard Hat Work? The hard hat is the most common piece of safety equipment, but how does it protect you? 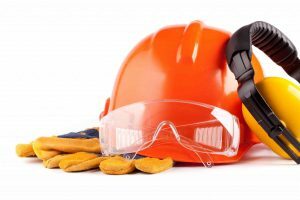 Hard hats are probably the most commonly used and recognizable pieces of construction safety equipment. Just about everyone has seen or worn one in their lifetime, whether at work or just working on their own home. But do you know how exactly a hard hat works? Modern hard hats are made out of a kind of plastic called high-density polyethylene, which has a high strength-to-density ratio. This plastic is used in a wide variety of applications, from plastic bottles to corrosion protection for steel pipelines. The modern hard hat was born out of shipmakers’ practice of covering their hats in tar and setting them in the sun to harden. The hardened tar would protect workers’ heads from objects dropped from ship decks. Aside from the hard outer shell, a hard hat is designed to dissipate the force of a falling object through suspension bands. The bands float the shell above the wearer’s head so that when a falling object hits the helmet, the force of the blow is spread across the entirety of the helmet. The space between the hard hat and the wearer’s head also makes it less like that the force of the impact will be transmitted directly to the skull. This entry was posted on Friday, October 7th, 2016	at 11:22 am	. Both comments and pings are currently closed.